Available online or via Bunnings special orders desk. Deliver the power of petrol with the ease of electric with the RYOBI 36V Brushless Lawnmower Kit. The RYOBI 36V Brushless motor delivers the ultimate standard in battery-powered performance. So no matter how tough the job is, you can handle it without waiting on the engine to warm up, battling a choke, or straining on difficult pull-starts. And with 7 separate cutting heights, you can always leave your lawn with the perfect finish. The RYOBI 36V Brushless Lawnmower Kit includes everything you’ll need to get straight to work. The mulch plug and grass catcher allow you to move the trimmings in whatever way you need. And to quickly get to work, the 36V 5.0Ah battery comes with RYOBI’s revolutionary 36V Fast Charger. 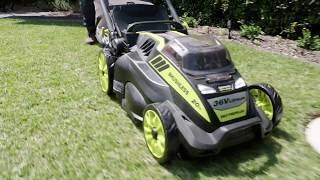 If you need petrol performance without the hassle, get yourself a RYOBI 36V Brushless Lawnmower Kit from your local Bunnings Warehouse.